The Professional Services Automation Experts Rank in the Top 5% of a Select Group of Professional Services Organizations. TOP Step Consulting, a leading provider in delivering superior operational efficiency solutions to professional service organizations, has once again been recognized worldwide as “Best of the Best” in the professional service industry in a benchmark survey conducted by independent research firm Service Performance Insight (SPI). This is the company’s seventh consecutive year being among those honored with the title. TOP Step Consulting specializes in providing project-based cloud applications solutions, and has done so for over eight years for both national and international clients. According to Service Performance Insight's 2016 Professional Services Maturity™ Benchmark report, there were 549 participating organizations judged on five service performance areas –Client Relationships, Finance and Operations, Human Capital Alignment, Leadership, and Service Execution. For the past five years, Service Performance Insight has conducted in-depth analysis of the top 5% of PS Maturity™ benchmark participants to uncover the reasons for their superlative performance. Each year, the top 5% have been named "Best-of-the-Best" based on superior PS Maturity™ benchmark scores. TOP Step Consulting prides itself on being professional service experts that continually improve business efficiency for its clients so that clients may achieve their full potential, with the ultimate goal of increasing profitability. 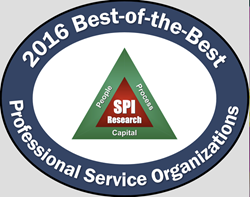 Being identified as a member of SPI’s Best of the Best is confirmation of the company’s success. Find client testimonials on the TOP Step Consulting website at http://topstepconsulting.com/our-customers/. TOP Step Consulting, LLC is a leading expert in professional services automation (PSA) that assists businesses with improving business efficiency and productivity to simplify their complex global operations. They provide advisory, implementation and outsourced administration services to over 270 world-class professional services organizations worldwide. Their goal is to streamline operations, and help their customers achieve profitability goals that result in focused business growth. To learn more please visit http://www.topstepconsulting.com. (SPI)is a global research, consulting and training organization dedicated to helping professional service organizations (PSOs) make quantum improvements in productivity and profit. In 2007, SPI developed the PS Maturity Model™ as a strategic planning and management framework. It is now the industry-leading performance improvement tool used by over 10,000 service and project-oriented organizations to chart their course to service excellence.